Announced September 14, 1956 and withdrawn August 18, 1969. 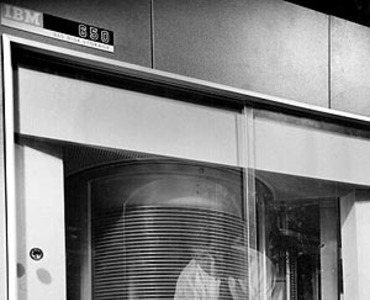 The addition of disk storage to the IBM 650 Magnetic Drum Data Processing Machine made possible "single step processing." Instead of accumulating data to be processed in stages, transactions could now be processed randomly as they occurred and every record affected by the transaction could be automatically adjusted in the same processing step. 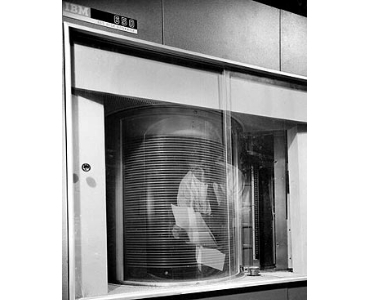 Each IBM 355 held 50 disks subdivided on each side into tracks for the storage of almost all active accounting records. Up to four IBM 355 units could be connected to the 650 system. The following is an extract from an IBM 650 press fact sheet distributed on September 14, 1956. The latest addition to the 650 is the IBM 355 random access memory, a storage medium in which any group of data may be reached quickly and directly, without search. Up to four 355 memory units may be connected to the 650 system. A 355 is a stack of 50 metal disks, each two feet in diameter. Both sides of the metal disks are treated so that 100 disk faces are available for storage. On each disk face there are 100 concentric data tracks. Six-hundred digits of recorded data may be stored in each track. In other words, each track holds 60 words with signs. Each 355 unit has a capacity for 6,000,000 digits. With the maximum of four units, the 650 can have available, therefore, 24,000,000 digits stored in a random access memory. This is the equivalent to a file of records stored on 300,000 punched cards. To process file data, the information stored in the memory is read from and written into the data tracks on the magnetic disks by access arms. The magnetic disks in each unit continuously rotate past three independent access arms at 1200 RPM, and each arm can move to any data track. The access arms move under instructions stored in the 650. A seek instruction sends an arm to the addressed data track. A read instruction causes the access arm to read the addressed data track into immediate access storage (the IBM 653 magnetic core memory). A write instruction causes the arm to write into the addressed data track the information that is in immediate access storage.